Congratulations to the recipients of this year’s Amerikam Bruce Gregory Scholarship, Andrew and Karley! 2017 marks 45 years of collaboration in education between Amerikam and Ferris State University. The Amerikam-Ferris Project tests students’ knowledge by assigning each team an Amerikam product. Teams analyze ways to manufacture the product, from design and tooling to equipment. Students then develop costs and sale prices for products. After weeks of hard work, each team presents their solutions to Amerikam managers and engineers and Ferris faculty. 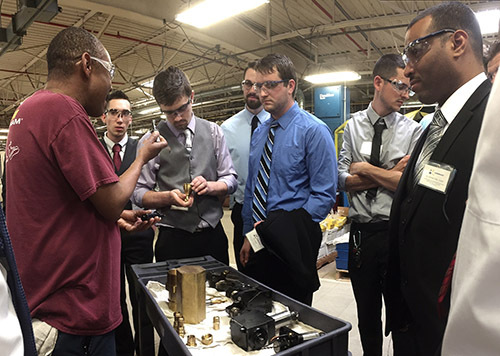 During the visit to Amerikam, at the conclusion of the presentations, managers and engineers lead students on a tour of the manufacturing facilities, lending insight into Amerikam’s production processes. Students also have opportunities to speak with representatives from the company’s purchasing, human resources, and quality assurance departments.